Matt Yglesias wonders “if one of these days we could have a real technical expert run DOT rather than a politician.” David Gunn, former head of Amtrak, has made the same complaint. I’m obviously sympathetic, but it is the right idea for the wrong position. What I mean by that is that much of the technical dysfunction falls under the FRA. It was on this date four years ago that the Senate confirmed Joe Szabo to head the FRA. And whereas Obama’s second term will be getting a lot of new blood, that does not appear to be the case with the FRA. The country will apparently be stuck with Szabo, which is not a good thing for advocates of intercity and high-speed rail. His record over the past four years is dreadful. The FRA has budgeted over $12 billion on projects, without accomplishing even one mile of HSR line. And despite many promises, the onerous FRA regulations have, if anything, gotten even worse. The PTC mandate is behind schedule, and his FRA funded the idiotic Caltrain CBOSS project. The next two years will be critical — do we really want the guy who tried to paint the letter “F” on locomotives? MARC is one of the few commuter rail operations in the US that still does not permit any on-board bike access. Not even the off-peak and reverse-commute runs. By comparison, some heavily used systems like BART Caltrain offer considerable bike accommodation — even during peak hours. One of the excuses heard from MARC staff is that bikes could become a lethal “projectile” in the event of a collision. This is one of those myths that just won’t die. There has been decades of operational experience all over the world, and I have yet to find a single instance of a passenger being impaled by a flying bicycle. And that isn’t to say it isn’t theoretically possible, but then again it is theoretically possible for anything onboard a train to become a projectile — strollers, luggage, iPads, or other passengers. 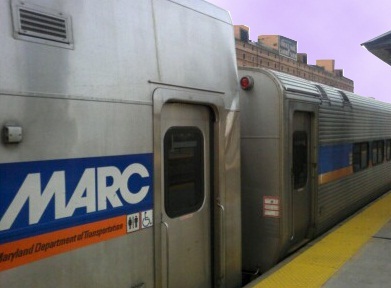 Governor Martin O’Malley announced today that the Maryland Transit Administration (MTA) is investing $153 million to acquire fifty-four (54) new “multi-level” passenger rail cars for the MARC commuter rail system. The cars, manufactured by Bombardier Transport, will replace older cars that have reached the end of their service life, allowing MARC to provide additional seating capacity while expanding its existing fleet. The Board of Public Works approved the purchase today. Seating capacity on board is greater than those of the cars that they will replace. They will come in three variations. Fifteen (15) new “cab cars” that contain an engineer’s compartment for operation will seat 127 passengers. Thirty-four (34) “trailer cars” will hold 142 passengers, and five (5) cars containing bathroom facilities will hold 132 passengers. The new cars will have a useful life of up to 40 years. When they come online, MTA will retire twenty-six (26) single-level passenger cars and twelve (12) Gallery style cars. Overall, the MARC fleet will expand by sixteen (16) cars. Oh, and the new cars will have zero bike racks. Nor any other kind of on-board bike access. 80% of the funding came from the Federal government. Federal transit grants come with a long checklist of requirements, including ADA, Buy-America, and Civil Rights. Bike accommodation really needs to become part of the Federal grant approval process. No Federal transit dollars should pay for this kind of crap. When Amtrak planned the Acela back in the 1990s, one of the design goals was to use an off-the-shelf trainset. That would avoid years of debugging and extra costs involved with designing a new train. Of course, it didn’t work out that way — thanks to the FRA. The FRA created so many special rules, that Amtrak had no choice but to build a custom train. And has the FRA learned anything from that fiasco? You would have thought so, based on the joint press conference held by the FRA, Amtrak, and the CHSRA. The key message was that this time Acela-2 would be an off-the-shelf design, and that the FRA would do everything possible to help Amtrak achieve that goal. FRA believes that future high-speed operations will in comparison save on bids because of the increased number of trainsets and carbuilders that will meet the final rule’s standards with little or no modification compared to the number that would have met the prior rule’s standards with little or no modification. The assumption that the standards simplify the design process of the equipment and would save $2,000,000 per train set is false. The Acela example indicates the exact opposite to be true. The FRA rules, as existing and proposed, eliminate the possibility of purchasing off-the-shelf equipment. The engineering work required to design new compliant equipment alone would far outstrip any possible savings from the rules if there were any to be had. FRA believes that the former rule would not have permitted many, and perhaps might not have permitted any, carbuilders to offer off-the-shelf equipment with little or no modification that would have met the acceleration requirements on track with geometry having the maximum allowable deviations. Under the final rule it is likely that several carbuilders could provide off-the-shelf equipment that will meet acceleration requirements on minimally compliant track. This will lower costs through increased competition, and use of existing designs. Further, railroads may now be able to order equipment without tilting mechanisms and operate that equipment at high cant deficiencies, thus saving the costs of tilting mechanisms and making the number of available trainsets even greater. Based on the above, FRA does not agree with Amtrak’s comment for the purposes of this final rule. It is not unreasonable to estimate that the equipment procurement benefits alone will justify the costs of the rule. However, even if FRA eliminates from consideration equipment procurement benefits, as a result of Amtrak’s comment, FRA believes the high cant deficiency and streamlined testing requirements would justify the costs of the rule. This is mind boggling. Despite HSR being a top priority of the President, the FRA is still creating roadblocks. You really get the idea that FRA bureaucrats are living under a rock. The ultimate responsibility, though, is FRA Administrator Joe Szabo. I’ll have more to say about him in a follow-up posting. A state trooper who said he was “trying to be nice” stopped a state legislator for speeding on I-10. But instead of writing Rep. Charles McBurney a $250 speeding ticket, the trooper, in his own words, “cut him a break” and offered him a much cheaper alternative of a $10 fine for not having proof of insurance. As a result, he got fired. McBurney said he was not going 87 miles per hour as Trooper Charles Swindle alleged, and that his cruise control was set at 75. The lawmaker also said he did have proof of insurance, which he said Swindle didn’t request. Outraged by the trooper’s conduct, the lawmaker complained to Col. David Brierton, head of the Florida Highway Patrol — and last week the FHP fired Swindle for violating department rules, including conduct unbecoming a public employee. Swindle has hired a lawyer and is challenging the firing and claims the patrol has a long-running unwritten “quid pro quo” policy of not issuing traffic tickets to state legislators. WFTV obtained more video Friday that shows an Orlando police officer hitting a pedestrian with his squad car. Police will only say he’s under criminal investigation, but Officer Michael Fiorentino-Tyburski is still allowed to patrol the streets. It’s been almost three months since the pedestrian was hit at Hughey Avenue in downtown Orlando. An investigator concluded in January that the officer was at fault for leaving the scene. The video shows the victim, Tetris Nunn, rolling over Orlando patrol car No. 8128 with Fiorentino-Tyburski behind the wheel. On Friday, Channel 9 obtained the 911 calls and radio transmissions in the case. On the radio transmission, Fiorentino-Tyburski can be heard dodging questions his own department was asking him. “Ten-four. We just got a caller for a Signal 4 at Hughey and Washington and we’re just trying to figure out if that was you,” the dispatcher said. “I’m not there anymore. Who called it in?” asked Fiorentino-Tyburski. “Signal 4” is code for a crash and it was the victim who called it in on an witness’ cellphone. He said the officer hit him and left the scene. “Did the officer say he was coming back or why did he leave if he hit you?” asked the operator. “Uh, he just hit me and, you know what I’m saying, he was, he blamed it on me and he just took off,” said the victim. Here is video footage of the incident. Investigators say the victim was jaywalking. Unfortunately, the ped signal isn’t visible in the video, although it does appear he was walking with a green light. The Google Streetview location of the intersection is here. The court released a single-sentence ruling late Thursday, March 28, denying a writ of mandate filed by the environmental group Friends of Riverside’s Hills. The group sued the Riverside County Transportation Commission in 2011, claiming it had failed to address a number of environmental consequences of the commuter train plan. Yet the full text made available Monday, April 1, shows Judge Sharon J. 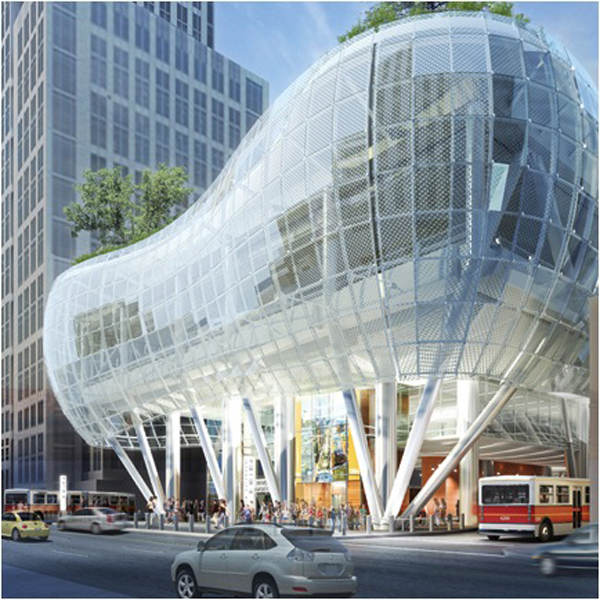 Waters ruled for Friends on five of 15 points noted in the project’s environmental impact report: the effects on soil, use of track lubricant, pedestrian safety, train wheel noise and construction noise. Hopefully the project won’t get held up because the EIR failed to mention the use of track lubricant. And as bad as it is on the outside, it will be even worse inside.